Diplomatic Reality: U.S. Relies On 'Useful Autocrats' : The Two-Way Once again, an American president and his diplomatic aides are walking a difficult line. They're caught between the desire to support the aspirations of demonstrators demanding democracy and freedom, and long-standing U.S. support for an autocrat. Jan. 30: A man in Cairo's Tahrir Square holds an anti-U.S. sign. As the crisis in Egypt continues, there's a certain sense of deja vu for many who follow U.S. foreign policy. Once again, an American president and his diplomatic aides are walking a difficult line. 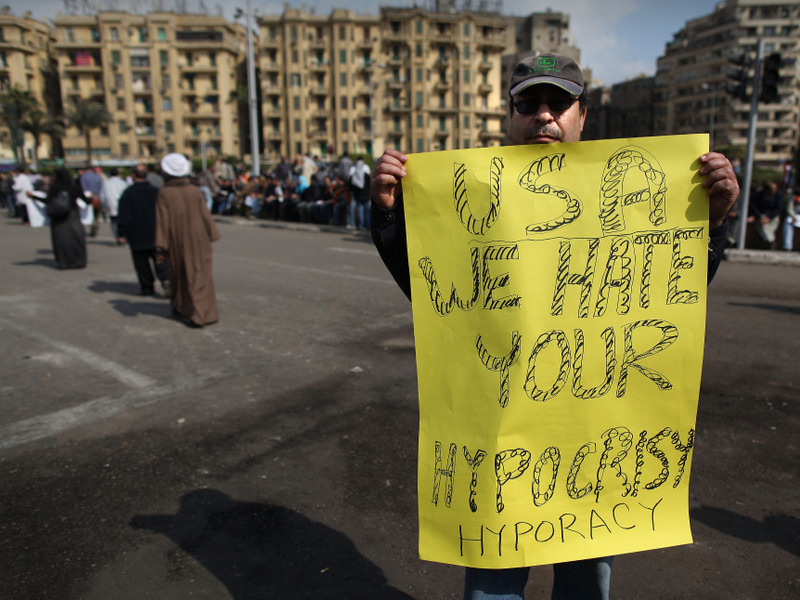 They're caught between the natural desire to support the demonstrators demanding democracy and freedom, and long-standing U.S. support for an autocrat (in this case, Egyptian President Hosni Mubarak). This hour, All Things Considered co-host Robert Siegel asked Joshua Keating, associate editor of Foreign Policy magazine, whether it is inevitable that the U.S. will often have allies who fall "embarrassingly short of our standards of democracy or human rights?" "I do," Keating replied. "Unfortunately it's been a reality throughout U.S. history" that at times the nation needs the help of foreign dictators. "If you look at one of the most famous alliances with an autocrat we've ever had," he continued, "the U.S. probably would have a hard time winning World War II without the help of the Soviet Union and Joseph Stalin, one of the worst mass murderers of 20th Century." Among the problems that creates (as now in Egypt), Keating added, is that "these guys don't last forever, and often when they face major challenges to their influence the people on the streets remember who's been supporting these governments and providing them with weapons for years and years." Much more will be on today's edition of ATC. Click here to find an NPR station that broadcasts or streams the show.